Why is the Religion of Classical Rome and Greece still a worthwhile study in this age? I. First of all, Classical Antiquity is not dead but rather a precursor and living presence permeating virtually all facets of the culture of the Western world, and, to lesser degree, the Near East and North Africa. Roman culture returned to flower in the Renaissance, roots largely undamaged. It was too beautiful to destroy, even in the sight of adversaries. The Eternal City surely endures in a dozen daughter nationalities; in language, literature, laws, philosophy, engineering, the arts, and even theories of government. Her ancient Deities are equally pervasive in Western art, music, literature; and concealed in Judaeo-Christian imagery of Deity, saints, and spirituality. Many of the saints are but old gods under an alias, as are numerous holidays and feasts across the calendar. Our famed Statue of Liberty is the Roman Goddess, LIBERTAS, frequently honored on the coinage of Emperors Nerva and Caracalla. The Greek Goddess, Themis Astraea, is enshrined in many of our Courts, personification of impartial Justice. Secondly, our modern times are experiencing a rebirth of interest in paganism and nature- centered religions, owing to factors including the withering away of Church temporal power to punish such inquiry and a generalized sense that the eschatological threats and promises have failed to materialize in the span of two millennia. 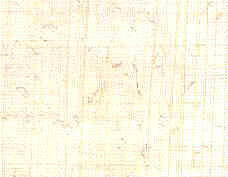 The New Jerusalem never descended from the heavens as anticipated, the Millennium did not arrive, but Constantine's religious coup d'etat was clearly unanticipated by apostles and Church Fathers, and it eventually fueled bitter and endless conflicts. * PAGAN: In Latin, paganus, a derisive term used by Fourth Century Christian proselytes to describe followers of the old ways as rustic or countrified. Compare the modern Italian paisano. The traditional religion of the Romans neither had nor required a distinctive name. Sometimes the phrase MOS MAIORVM was applied in the broad sense, meaning simply custom of the ancients. It was, then, a body of custom, not an -ism, ideology, theology, or belief system! This point should become clearer as I proceed. * CULT: This is Latin CVLTVS, of the same root as cultivation and culture. A word for worshipper was CVLTOR (m) or CVLTRIX (f). A relationship with a Deity is an effort at cultivation, just as in growing fruit or grain. One's practice over time imparts experience and greater familiarity with the previously mysterious, and the measure of success is fruitful reward of some kind. Otherwise, we try another crop or another Deity who may prove more responsive! relegère, to collect again or review, from lègère, to read, recite, or choose. dîligère, to esteem, value, or appreciate. RELIGIO, to the Roman, further encompasses the meanings of sense of right, conscience, reverence, awe, sanctity, the object of veneration, ritual, taboo, and scrupulous regard. In 1997 I coined a term, Paramythia, to globally embrace my personal spirituality, but have found that all of this vast territory was once upon a time covered by RELIGIO; that later generations whittled down a vast magisterium essentially to attain better span of control, for religion long became associated with a totalitarian control over human beings quite impossible in the classical Roman religion. Emperor Julian tried and failed c.361 C.E. to create a unified organizational hierarchy for the temples and priesthoods of the traditional Deities... like herding cats, they did not respond to attempts to centralize power and authority in a manner that did not traditionally belong to the Pontifex Maximus, an office we would call ceremonial. * NVMINA (pl.) * NVMEN (s.) is the final special term to be considered. It literally means a nod, as of the head, but imples divine consent, presence, majesty, power of a Deity. It is the footprint or mysterious trace of the ineffable, a strangeness sensed in a place touched by the sacred. A lake, a grove of trees, a burning bush, a place that feels liminal to consciousness. In Nature and in experience is the origin of our consciousness of the Gods: amid earth, air, fire, and water there is yet some experience of otherness. Perhaps this is the spirit of ancestors or spirits of the land itself: the LARES of the home or the crossroads; the PENATES of the pantry; the MANES of ancestors; the public and personal GENIVS; VESTA of the hearth; TELLVS MATER, the Mother Earth; AQUILO of the North wind or ZEPHYRUS of the West. Sacred spots after generations became shrines, and later shrines became great temples, and often those temples in turn were consecrated as churches or mosques, still in use. In Roman times the covenants had to be kept, mainly by appointed priests and priestesses, typically offering spelt cakes, incense, wine or milk libations. For some deities a special bull or sheep would be selected, slaughtered according to ritual practice, with certain parts used for augury or burned as offering on the God's altar. Most of the meat would be cooked as public feast, free food to the poor. Households honored their ancestral LARES and the PENATES while the Republic appointed priests to fulfill those covenants binding on the Roman people collectively, thus a distinction between religio of the family and that of the community. II. Roman religion was never exclusive, but naturally ecumenical. Imagery of the Gods was considerably influenced by Etruscan, Hellenic, and Oriental concepts. Deities shifted in importance and popularity, in fact the introduction of foreign gods was somewhat institutionalized through auguries. APOLLO, VENVS, CYBELE, and many others were among these. A new foreign god might be identified with and syncretized to one already recognized in the Roman pantheon. 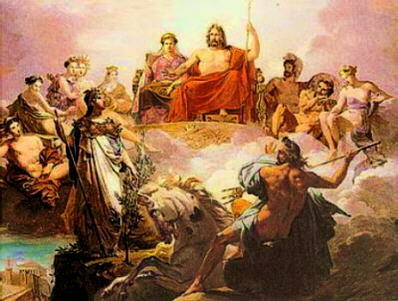 Among the Olympians one finds many paired identities: Athena=MINERVA; Zeus=IVPPITER; Hera=IVNO; Artemis=DIANA, etc. Twelve major Olympians, the dodekatheoi, are known, but numerous Italic, Etruscan, Celtic, and Oriental deities came into the Cosmopolitan fold, so much so that the more conservative elements mused that the Orontes, a Syrian river, had begun flowing into the Tiber! On the whole, Roman Religion was highly tolerant and more than willing to embrace new gods provided that the openness was reciprocal and non-subversive to Roman society. MERCVRIVS, VENVS, and APOLLO, elevating and harmonic in action. It can be noted that the Triad or Trinity is a favored number in the Roman perspective, linking back to Indo-European origins. OMNIVM TRIVM EST PERFECTVM, everything in threes is perfect. Iuppiter, Iuno, and Minerva were honored as the Capitoline Triad in a shared Temple at Rome's spiritual heart. The words tribe and tribune similarly indicate threefold division. Numerous gods represented those specific aspects of life: POSTVORTA (childbirth); LIBERTAS (freedom and universality); PIETAS (duty); PVDICITIA (modesty); FIDES (faith); SALVS (well-being, safety); ANNONA (the grain harvest). The typical Roman was concerned to avoid displeasing or alienating ANY god who might be helpful in times of need. Certainly a foreign god such as Serapis or Isis might be able to bestow great favors, so there was freedom to offer to, and bargain with whomever one wished. Extremist factions among the early Christians created a bad reputation for the new faith, but it is recorded that the Emperor Alexander Severus honored, by statues in his lararium, both Christ and the similar figure of Apollonius. His approach was likely typical in its ecumenism and syncretism. IV. Indeed, the Roman Gods and Goddesses are very much with us today, at the very least as active archetypes, while some would say more than this. We commonly speak of dispositions mercurial and jovial; and yes, diseases venereal... but we esteem the attitude of veneration. In conversation, one of our members remarked that she grew up with an imagery of God that bore marked resemblance to Zeus. This is by no means an accident, when examined carefully. Ancient votive inscriptions can be seen with the abbreviation I.O.M., Iovi Optimo Maximo, to Iuppiter the Best and Greatest. Christians in power occasionally carved the slight alteration to change the I.O.M. to D.O.M., "all else remaining the same", now reading Domini, to the Lord. The authentic pronunciation of the four-letter name of Jove is startlingly close to that unspoken Hebrew tetragrammaton, YHWH. I would suggest that both have a common origin in a time earlier than the split between Indo-European and Semitic languages... a name probably meaning "Day Father". This similarity of name was not likely lost upon the Roman philologists nor upon Hellenized Jews from the East. Conventionally, Christianity pictures itself in continuity with the Jewish tradition, but as Joseph Campbell observed, it is at least equally valid to trace the Hellenic lineage of Christianity, especially in such concepts as virgin birth, the God fathering a Son, born of the flesh... mortal, yet immortal. The Sacrificed God has been a dominant aspect of most Mystery Religions from the dawn of history. He may be Mithras, Attis, Adonis, Diónysos, Dumuzi, or Sol Invictus, but the mythology is much the same. (a) "For by necessity the gods above enjoy eternity in the highest peace, withdrawn and far-removed from our affairs. Free of all sorrow, free of peril, the gods thrive in their own works and need nothing from us, not won with virtuous deeds, nor touched by rage." (b) "Too often Religion herself gives birth to evil and blasphemous deeds..."
(c) "...And so this darkness and terror of the mind shall not by the sun's rays by the bright lances of daylight be scattered, but by Nature and Her law, whose fundamental axiom is this: nothing comes supernaturally from nothing. Fear grips all mortal men precisely because they see so many events on the earth, in the sky, whose rational causes they cannot discern--- so they suppose it's all the will of the gods." "Whatsoever befalls thee, it was ordained unto thee from the beginning of time. For by the same coherence of causes, by which thy substance from all eternity was appointed to be, was also destined whatsoever becomes of it."